Fish gelatin, vegetable glycerin, beeswax, natural orange flavor, natural caramel color, sunflower lecithin, mixed vitamin E tocopherols (natural flavor protector), enteric coating. for best results take 1 softgel daily, with or without food or as directed by your healthcare professional. To maximize your Omega intake, take 2 softgels daily. Fish gelatin, glyceirn, beeswax, natural orange flavor, natural caramel color, sunflower lecithin, mixed vitamin E tocopherols (natural flavor protector), enteric coating. Norwegian Gold Super Critical Omega is a maximum-strength Omega-3 fish oil supplement with 1,025mg Omega-3 per softgel for powerful total-body health support. The high-EPA, super-concentrated oil blend supports healthy heart function and lowered risk of coronary heart disease; helps reduce stiffness in joints and promote overall joint and muscle comfort; and helps reduce anxiety and improve mood. Added Vitamin D3 supports cognitive function and bone health. Leading the way in Omega-3 supplementation, Norwegian Gold Ultimate Fish Oils combine concentrated EPA, DHA and other powerful Omega oils to promote optimum digestive function and enhance overall health. fish gelatin, natural orange flavor, glycerin, beeswax, lecithin, natural caramel color, enteric coating. Contains non-GMO soy. 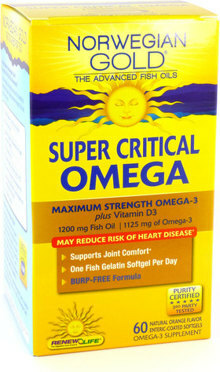 Take 1 fish gel daily or as directed by your healthcare proffesional. 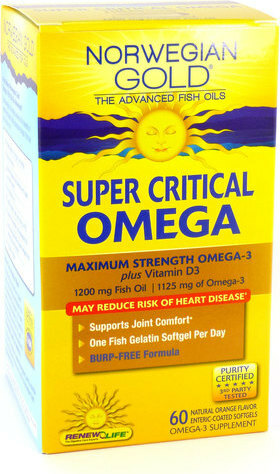 To maximize your intake of Omega 3, take 2 fish gels daily.